Want to start your own business but don’t have sufficient starting capital? Want to have stable additional income without putting too much time or effort into it? Looking for a small business with a quick return on your investments? Then the vending machine business is just what you are looking for! The vending business is picking up fast in Russia. Today not only large companies but also many private individuals now understand that it is enjoyable and profitable. Machines are reliable and do not require complex servicing and frequent repairs. Modern vending machines are equipped with GSM-modules for full control at long distance, so you won’t even have to check them every day, once or twice a week would be enough. There’s such a great choice of vending machines that it may be confusing. Boxing machines have always been popular with customers of shopping and entertainment centers, parks, restaurants and cafes. We would like to draw your attention to our new vending machine – the boxing machine Rocky Boxer. It is an excellent choice both for those who want to buy a vending machine for the first time and those who already make their living from vending and want to expand their business. It is very easy to start your own business with Rocky Boxer. 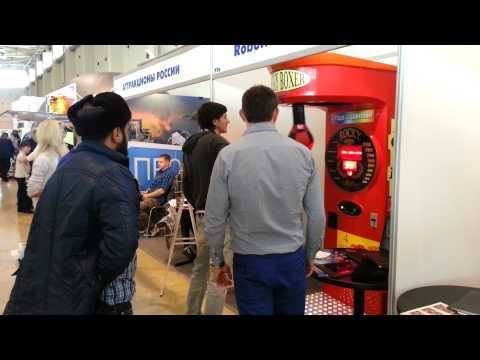 The boxing machine doesn’t need any consumable materials, so Rocky Boxer is a business without additional expenses. You don’t need to buy several machines at once, if you can’t afford it. One is enough to begin with. In other words, you will only need approximately 100,000 rubles to start your own business. You will get your return on it in 2-3 months. You won’t need any permissions or licenses to install your boxing machine. All you may possibly need is a rental agreement with the administration of the venue where the machine is going to be installed. Thanks to the great flexibility of settings and excellent technical characteristics Rocky Boxer is one of the most convenient, practical and profitable machines for vending.